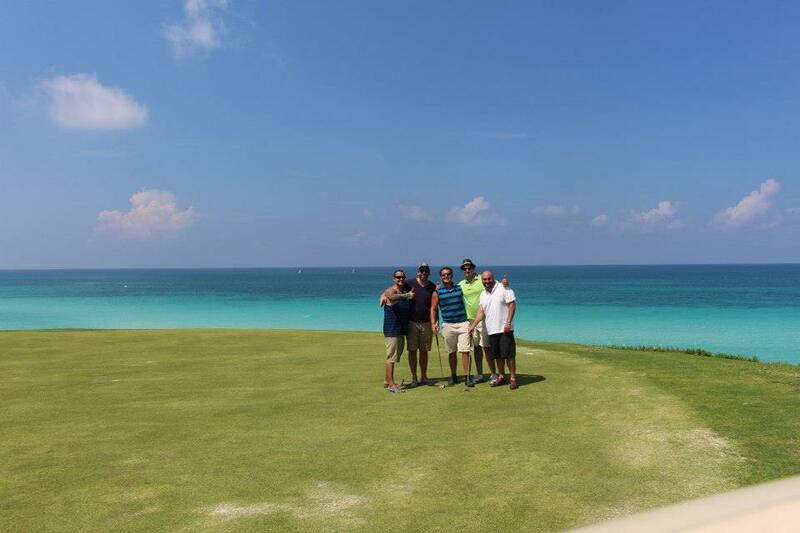 Back in October I was on vacation in Varadero, Cuba (forth time in two years) and on a whim decided to go golfing; and was I ever glad I did. 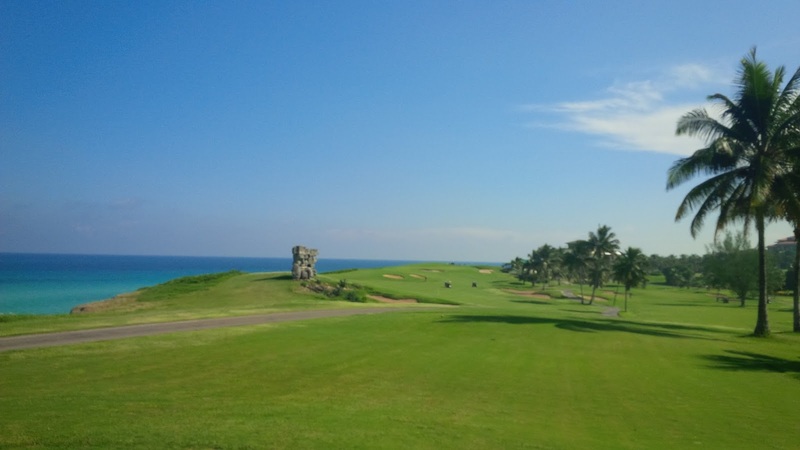 Boasting challenging holes and a beautiful 18th finish, I had to try out Varadero Golf Club this time around. 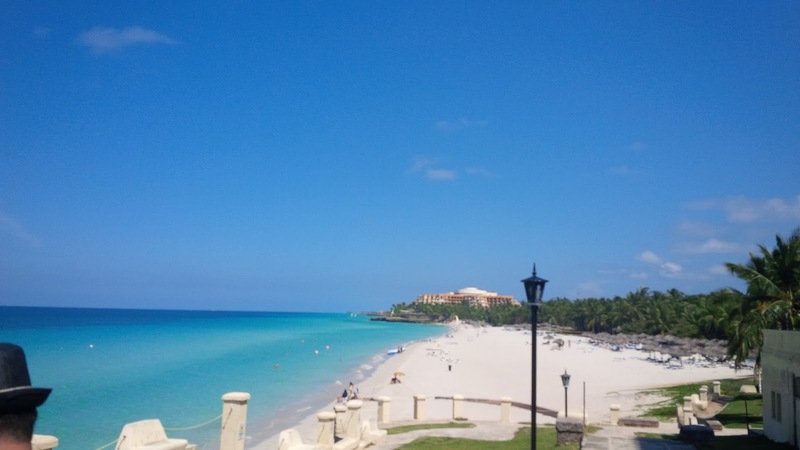 So off we went early one morning (five of us in total) to the Varadero Golf Club. Real Man Travels loves to golf! Pulling up to the golf club, you could see eight foot high chain link fences caging in the maintained palm trees, the rooftops of resorts close by, and of course, an old Spanish colonial clubhouse. As with most things Cuba, the course looked dated. The paths were older concrete and cracked almost everywhere. The clubs to rent were also dated and very hit and miss. But to be honest, it didn’t matter to me, I just shoot for fun. The course looked huge, vibrantly green and well maintained, especially for the hot climate (it was 35 degrees Celcius that day). One of the holes on the course with a water hazard. This clubhouse was a beauty. Pure old Spanish colonial oozing out of every little detail. Why take the stairs to the rooftop bar when you can take an elevator with iron grates and buttons. It was a bit dicey, but it worked. The rental shop was a closet with shelving and really stood out as an eye sore amongst the beauty of the rest of the clubhouse. The restaurant sits about 40 feet above the beach and looks out to the clear blue ocean, a perfect setting for lunch or dinner. It could’ve been the rental clubs, the 35 degree weather, the eight beers or that that this was actually a hard course to play. Either way, I had an awful showing shooting a 108. I normally shoot in the low to mid 90’s. The course was actually quite challenging. The par fives play very long and some holes require you to be able to drive 225+ yards just to clear the first water hazard. Definitely not beginner friendly. While the course is quite challenging, the views on the 9th and 18th holes are to die for. I have never golfed ocean side and now I wish I could all the time! 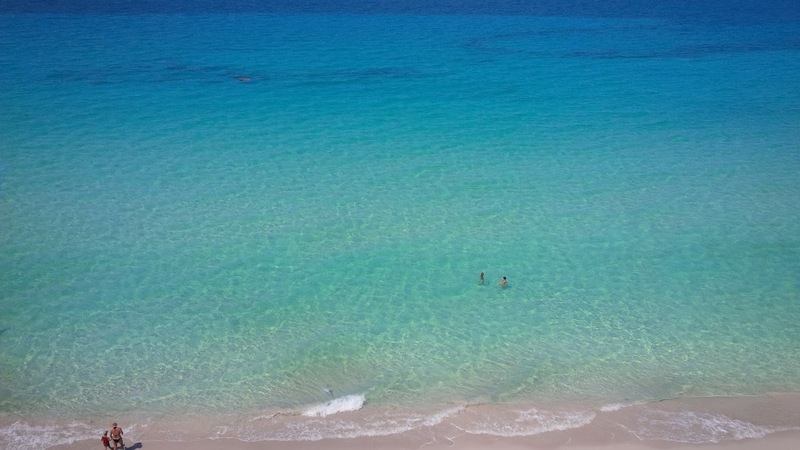 It was absolutely stunning to be on the green looking out at nothing but rich blue water for miles. I didn't try any food, but definitely had my fair share of beer. Typical offerings of beer here are the Cuban brands Cristal and Bucanero as well as some imports like Corona and Heineken. They also have many liquor and mixed beverage offerings. Lastly, the rooftop bar has a wide variety of cigars for your purchasing pleasure. View looking down the beach from the clubhouse patio. 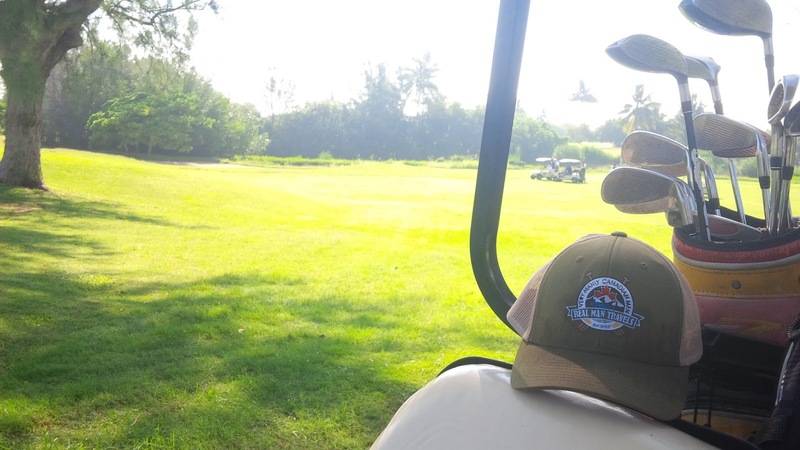 Your 18 hole green fee, cart and clubs costs 95CUC, which is approximately $95US dollars. This is pretty steep in terms of Cuba, but when on vacation you can’t complain about spending some money for a good time. You will get a solid four hours out of the day, on a beautiful course that will challenge you, regardless of skill level. And you will have amazing photo opportunities on the 9th and 18th hole to get framed up or blast on social media. The golf club allowed us to play as a fivesome which was a huge game changer. It allowed all of us to be together and share a day of laughs and frustration. 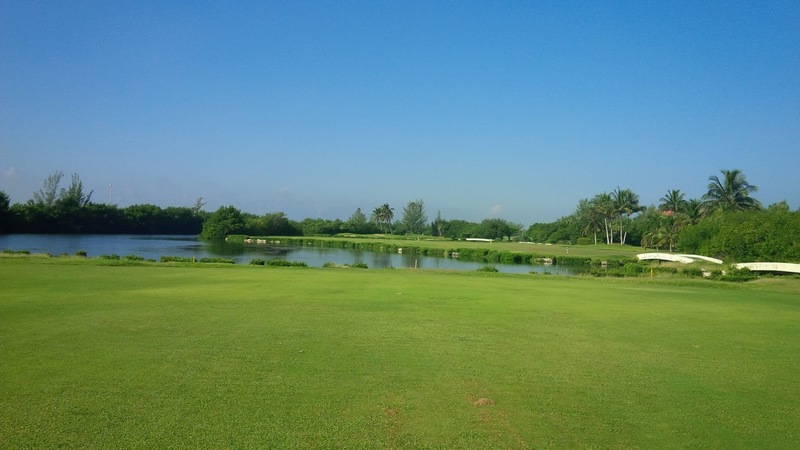 The weather was unbelievably hot (35 degrees Celcius + humidity), a temperature I am not used to playing golf in and had me completely drained by the 12th hole. The course was beautiful, challenging, well maintained and the beer cart guys were always quick to find us. The clubhouse was stunning, with all its Spanish details, and the view from the bar and restaurant were breathtaking. The price seemed a bit high for Cuba, but as stated earlier, for an afternoon out with my friends it was worth every penny. Overall, I give this course a 3.75 out of 5.